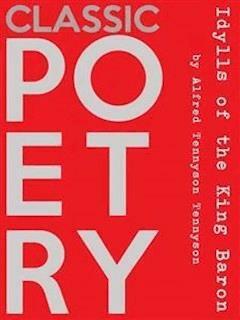 Idylls of the King, published between 1859 and 1885, is a cycle of twelve narrative poems by the English poet Alfred, Lord Tennyson (1809–1892; Poet Laureate from 1850) which retells the legend of King Arthur, his knights, his love for Guinevere and her tragic betrayal of him, and the rise and fall of Arthur's kingdom. The whole work recounts Arthur's attempt and failure to lift up mankind and create a perfect kingdom, from his coming to power to his death at the hands of the traitor Mordred. Individual poems detail the deeds of various knights, including Lancelot, Geraint, Galahad, and Balin and Balan, and also Merlin and the Lady of the Lake. There is little transition between Idylls, but the central figure of Arthur links all the stories. The poems were dedicated to the late Albert, Prince Consort. The Idylls are written in blank verse. Tennyson's descriptions of nature are derived from observations of his own surroundings, collected over the course of many years.The dramatic narratives are not an epic either in structure or tone, but derive elegiac sadness in the style of the idylls of Theocritus. Idylls of the King is often read as an allegory of the societal conflicts in Britain during the mid-Victorian era. ‘"Rain, rain, and sun! a rainbow in the sky! ‘Hast thou no pity upon my loneliness? Yea—some she cleaved to, but they died of her. How can ye keep me tethered to you—Shame. Man am I grown, a man’s work must I do. Mother, to gain it—your full leave to go. She answered craftily, ‘Will ye walk through fire? ‘A hard one, or a hundred, so I go. One crying, ‘Let us go no further, lord. ‘Know ye not then the Riddling of the Bards? Elusion, and occasion, and evasion”? Clashed; and the sound was good to Gareth’s ear. ‘A boon, Sir King! Thine enemy, King, am I. ‘A boon, Sir King! I am her kinsman, I. An oak-tree smouldered there. ‘The goodly knight! ‘A goodly youth and worth a goodlier boon!